Feather drawing workshop in colored pencil at Rare Bird in Oakland! I am teaching a colored pencil class on Sunday, May 5th, 2019 from 11.30am-2.30pm. Sign up here: www.therarebird.com I will be demonstrating step-by-step how I choose my colors, color block, layer, blend and add textures. Each student will bring home a starter kit of Prismacolor colored pencils, an eraser and feathers! It is going to be both educational and fun so join me for a few hours of art making! Bird drawing class in colored pencil at Rare Bird in Oakland! I will be teaching a workshop in colored pencil on Sunday, June 2nd, 2019 from 3.30pm-6.30pm. Sign up at: www.therarebird.com I will be demonstrating step-by-step how I choose my colors, color block, layer, blend and add textures. 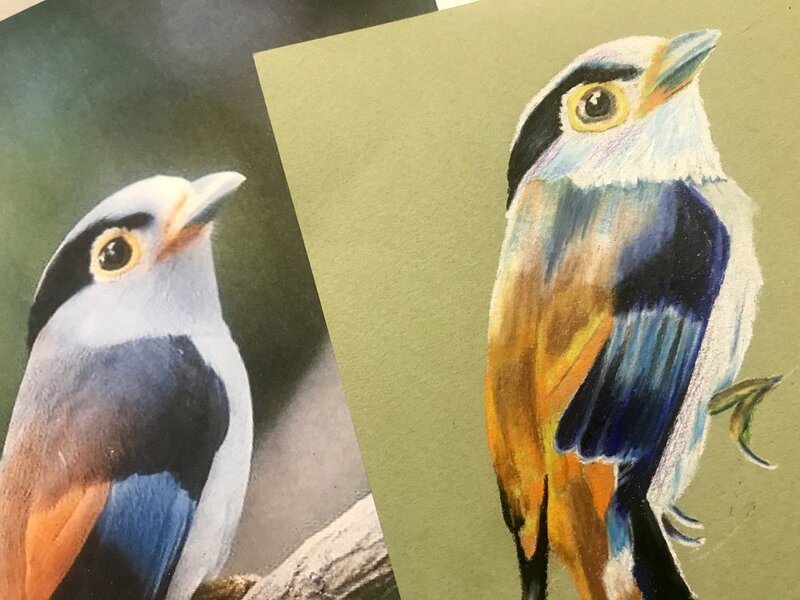 Each student will bring home a starter kit of Prismacolor colored pencils, an eraser and images of birds! It is going to be both educational and fun so join me for a few hours of art making!